Edward Franklin Albee III was an American playwright known for works including Who's Afraid of Virginia Woolf?, The Zoo Story, The Sandbox and The American Dream. His works are considered well-crafted and often unsympathetic examinations of the modern condition. His early works reflected a mastery and Americanization of the Theatre of the Absurd that found its peak in works by European playwrights such as Jean Genet, Samuel Beckett, and Eugène Ionesco. Younger American playwrights, such as Pulitzer Prize-winner Paula Vogel, credit Albee's daring mix of theatricalism and biting dialogue with helping to reinvent the post-war American theatre in the early 1960s. Albee's dedication to continuing to evolve his voice — as evidenced in later produ Edward Franklin Albee III was an American playwright known for works including Who's Afraid of Virginia Woolf?, The Zoo Story, The Sandbox and The American Dream. His works are considered well-crafted and often unsympathetic examinations of the modern condition. His early works reflected a mastery and Americanization of the Theatre of the Absurd that found its peak in works by European playwrights such as Jean Genet, Samuel Beckett, and Eugène Ionesco. Younger American playwrights, such as Pulitzer Prize-winner Paula Vogel, credit Albee's daring mix of theatricalism and biting dialogue with helping to reinvent the post-war American theatre in the early 1960s. Albee's dedication to continuing to evolve his voice — as evidenced in later productions such as The Goat or Who is Sylvia (2000) — also routinely marks him as distinct from other American playwrights of his era. 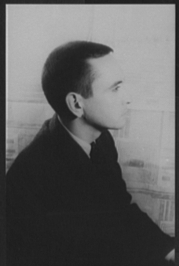 Albee himself described his work as "an examination of the American Scene, an attack on the substitution of artificial for real values in our society, a condemnation of complacency, cruelty, and emasculation and vacuity, a stand against the fiction that everything in this slipping land of ours is peachy-keen."